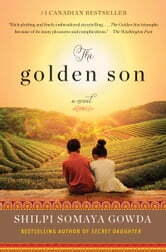 An instant bestseller in Canada, The Golden Son is a "sensitive and intelligent work" with an unforgettable story of family, responsibility, love, honour and tradition, in which two childhood friends must balance the expectations of their culture and their families with the desires of their own hearts (National Post). Author of the bestselling Secret Daughter, Shilpi Somaya Gowda’s The Golden Son is about a young Indian doctor who leaves his village for a residency in the US. But he grapples with the expectation that as the oldest son, he is expected to inherit the mantle of arbiter for all village disputes. And he finds himself torn between a beautiful American girl and his old childhood friend. The Golden Son ranks as high as The Secret Daughter, both very well crafted novels. I heartedly recommed both of them to other readers. I love how the author writes stories of interconnected characters who have thier own life stories going on at the same time. Beautifully written! Was sad that it ended. I look forward to the next book by this author. My dream is to travel to India. Intriguing and definitely kept my interest. Really enjoyed the viewpoint of the main character from two countries. I'm not a traveller but know many people who are and often wonder what my friends are like when they're out of the environment I know them in. Felt I got to know Anil and his friends and family.